Automatic Enrolment to a pension scheme is a new requirement for UK employers, and it means that every employer in the country must provide a pension scheme for their employee(s) and enrol them into it if they qualify. This can seem like a daunting amount of work for someone with a nanny. If setting up with a pension provider, sending all the regulatory letters to your nanny and then managing all the administration each month seems like a lot of work, don’t worry — NannyPaye is here to help. NannyPaye is able to provide a simple solution to auto enrolment for nanny employers. If you sign up to NannyPaye for your payroll, then all you need to do is choose which pension provider you want to use. If you choose to use NEST pensions then we will be able to fully manage your pension setup, running and maintenance for you. If you choose to use one of the other pension providers then we will be able to show the deductions that you tell us on the payroll but you will be responsible for the rest.. The below chart shows how we are able to work with NEST pensions. Here at NannyPaye we are unable to advise you on which pension provider you should choose. However, whichever one you choose to use, the minimum contribution percentages are the same. The NannyPaye Pension Service is priced at £60.00 per annum. 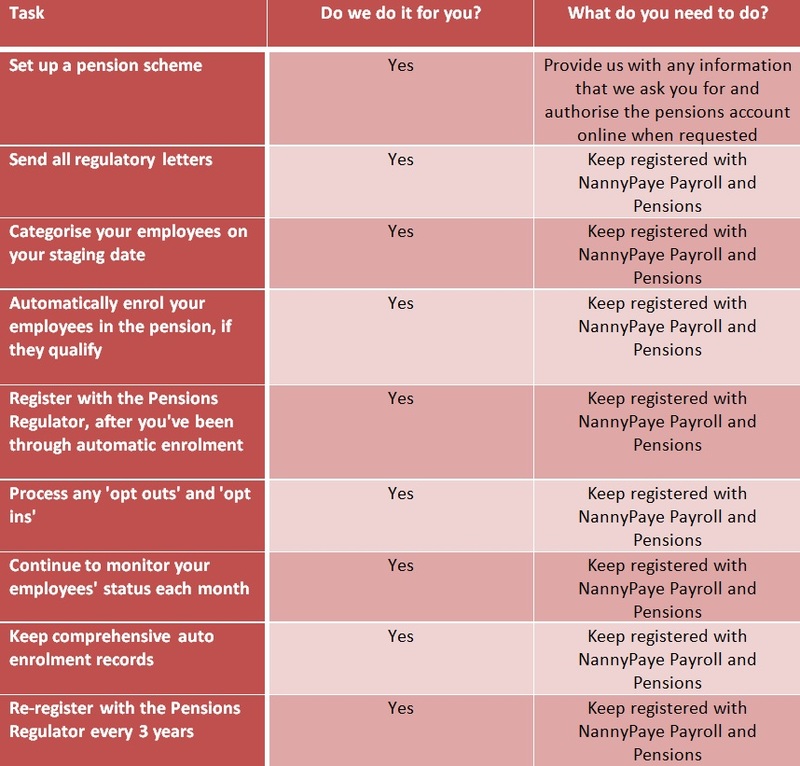 Although in this section we have detailed all of the obligations that you will have when going through auto-enrolment, it is important to remember that once you are registered on the NannyPaye Pension Service, the only things that you will need to do are to accept the NEST Terms and Conditions and give them your direct debit details. Everything else is completed by us. If you wish to register for the nannyPaye Pension Service whether it is becuase your staging date is coming up or you wish to voluntarily offer a pension before your staging date then you will need to complete the relevant form in the client login section to instruct us to do this for you.